The Invitation is a 2015 American horror thriller film directed by Karyn Kusama and written by Phil Hay and Matt Manfredi. The film stars Logan Marshall-Green, Tammy Blanchard, Michiel Huisman, and Emayatzy Corinealdi. 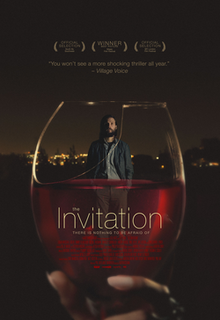 The Invitation premiered March 13, 2015, at the SXSW film festival, and began a limited release on April 8, 2016, and through video on demand, by Drafthouse Films. Responding to an invitation from his ex-wife, a man brings his girlfriend to a dinner party. There, he relives the trauma of their child's death and becomes suspicious that his ex-wife has ulterior motives for inviting him. Will drives with his new girlfriend Kira to the Hollywood Hills home of his ex-wife Eden, who is hosting a dinner party with her new husband David. Will and Eden divorced while trying to cope with their young son Ty's accidental death. Eden met David at a grief support group, and their party will be the first time any of their friends have seen the couple in over two years. On the way to the party, Will mercy-kills a coyote after striking it with his car. Will and Kira arrive. David and Eden's other dinner guests are Tommy, Tommy's boyfriend Miguel, and friends Ben, Claire, and Gina. Gina mentions that her boyfriend Choi is running late. Eden introduces Sadie, a girl she and David met while in Mexico who is now staying with them. Throughout the evening, Will wanders his former home alone and relives memories related to Ty's death, including Eden's attempted suicide. In the kitchen, Will witnesses Eden slap Ben when he makes a joke about her New Age ideas on expelling pain. Eden and David's friend Pruitt arrives. Will notices that David locked the front door. Will later goes for firewood and spies Eden hide a pill bottle through her bedroom window. David and Eden tell their guests about a group they joined along with Pruitt and Sadie called "The Invitation" to work through grief using spiritual philosophy. David shows everyone a video in which group leader Dr. Joseph comforts a dying woman as she takes her last breaths. David turns away unseen visitors and explains they were strangers looking for a party nearby. The group play a game of "I Want" where Eden kisses Ben, and Pruitt confesses to accidentally killing his wife and doing time in prison. David tries to stop an unsettled Claire from leaving, and Will confronts David. Claire leaves, accompanied by Pruitt, whose car is blocking Claire's. Will watches Pruitt take Claire out of sight to talk to her, and David confronts Will about being too suspicious. During dinner, Will internally reflects on Ty's death. While walking through a hallway, Will sees Sadie make odd faces into a mirror, and they have a strange poolside conversation. Will has a separate discussion with Tommy about the odd atmosphere in the house. Will finally gets a cell phone signal and finds a voice mail from Choi indicating that he was at Eden and David's doorstep before the other guests. Presuming that David and Eden must have done something to Choi, Will publicly confronts the couple about their apparent cult brainwashing. Choi enters unexpectedly, explaining that he was called away by work. Will is embarrassed, but the others assume his residual grief over Ty’s death is causing Will to behave irrationally. Will finds a laptop with information about The Invitation and their true motives: to create peace through death. David pours drinks for the guests. Will smashes the glasses, fearing they are poisoned. However, Gina drinks hers before Will smashes it. Sadie attacks Will who inadvertently knocks her unconscious in the scuffle. Gina suddenly collapses and dies, revealing that Will was right about the drinks. David, Eden, and Pruitt attack the guests, killing Miguel, Choi, and Ben. Will, Kira, and Tommy flee and hide in the house. Will overhears David telling Eden that what they are doing is the only way they can leave the earth and be freed from their pain. Will retrieves a fireplace poker from Sadie while she lies dying from apparently drinking the poison. Pruitt finds and attacks Will and Kira. The couple overpower him, and Kira beats him to death. Eden shoots Will and herself in the stomach, severely wounding herself. Tommy attacks David and stabs him to death in a brief scuffle. As she dies, Eden asks Will to come to her in her final moments. Kira, Will, and Tommy reunite and head outside with the dying Eden. Kira and Will hear sirens and see helicopters flying above. Will sees various homes with the same red lantern that David lit earlier in the evening. Will realises that Los Angeles is erupting in chaos as other cult members throughout the city carry out plans similar to David and Eden's. In May 2012, it was announced that Luke Wilson, Zachary Quinto, Topher Grace and Johnny Galecki had initially been scheduled to star in the film, with Karyn Kusama directing from a screenplay written by Phill Hay and Matt Manfredi, and XYZ Films producing the film alongside Martha Griffin, Manfredi and Hay. However, in July 2014, it was revealed that production on the film had concluded, with Logan Marshall-Green, Michiel Huisman, Emayatzy Corinealdi, Lindsay Burdge, and John Carroll Lynch starring. The Invitation is the second feature to be financed by Gamechanger Films. The film had its world premiere at South by Southwest on March 13, 2015. Shortly after, it was announced Drafthouse Films had acquired distribution rights to the film. The film went on to screen at the London Film Festival on October 9, 2015, and was released on April 8, 2016, in a limited release and through video on demand. The Invitation holds an 87% approval rating on review aggregator website Rotten Tomatoes based on 95 reviews, and has an average rating of 7.6/10. The critical consensus reads: "The Invitation makes brilliant use of its tension-rich premise to deliver a uniquely effective – and surprisingly clever – slow-building thriller." On Metacritic, the film holds a rating of 74 out of 100, based on 21 critics, indicating "Generally favorable reviews". Justin Chang of Variety wrote, "This teasingly effective thriller represents director Karyn Kusama's strongest work in years." Josh Kupecki of The Austin Chronicle said, "There are some very interesting ideas about grief, depression, and how we cope with life-changing events in this modern world, but ultimately, the film doesn't offer anything new to the 'dinner party from hell' subgenre." Dominick Suzanne-Mayer of Consequence of Sound rated it A− and wrote, "In so many words, The Invitation is supremely well-crafted," while Samuel Zimmerman of Shock Till You Drop said, "The Invitation is a startlingly adult thriller that, unlike Eden and her guests, is willing stare down the weight our lives can bear." Peter Martin of Twitch Film intoned, "The sincerity and craft on display notwithstanding, the movie achieves a limited, unsettling level, and then stops right there," while Drew Tinnin of Dread Central rated the film 4/5 stars and wrote, "The Invitation works so well because it taps into our general distrust of the world around us and how our survival instinct has been muted and ignored in order to maintain the appearance of being polite." Matt Donato of We Got This Covered rated the film 2.5/5 stars, writing, "The Invitation is a slow, SLOW burn that fails to find the winning ingredient that makes for a perfect dinner party thriller." Heather Wixson of Daily Dead rated it 4.5/5 stars and called it "some of the most assuredly confident and nuanced work from [Kusama] to date and one of the most devastating horror films I’ve seen in years." ^ B. Vary, Adam (April 7, 2016). "I'm Not Going Away, People". Buzz Feed. Retrieved December 31, 2016. ^ "The Invitation (2016)". Box Office Mojo. Retrieved December 31, 2016. ^ LaBrie, Sarah. "Director Karyn Kusama talks about her ensemble horror film The Invitation". Retrieved 10 April 2015. ^ Collis, Clark (February 11, 2016). "Mayhem is on the menu in new trailer for The Invitation". EntertainmentWeekly.com. Retrieved February 12, 2016. ^ Tartaglione, Nancy (May 11, 2012). "Luke Wilson, Zachary Quinto, Topher Grace Accept Karyn Kusama & XYZ's 'Invitation'". Deadline Hollywood. Retrieved April 8, 2016. ^ Yamato, Jen (July 14, 2014). "Karyn Kusama's 'The Invitation' The Next Gamechanger Pic". Deadline Hollywood. Retrieved April 10, 2015. ^ "The Invitation". South by Southwest. Retrieved April 8, 2016. ^ Kang, Inkoo. "Karyn Kusama's 'The Invitation' Bought by Drafthouse Films". Retrieved 10 April 2015. ^ Thickens, Holly (October 6, 2015). "#LFF 2015 BFI London Film Festival: THE INVITATION Review". ScreenRelish.com. Retrieved April 8, 2016. ^ Jaugernath, Kevin (February 11, 2016). "Watch: Dinner Gets Deadly In New Trailer For Karyn Kusama's 'The Invitation'". Indiewire.com. Retrieved February 12, 2016. ^ "The Invitation (2016)". Rotten Tomatoes. Retrieved April 8, 2016. ^ "The Invitation". Metacritic. Retrieved April 8, 2016. ^ Chang, Justin (March 15, 2015). "SXSW Film Review: 'The Invitation'". Variety. Retrieved April 10, 2015. ^ Kupecki, Josh (March 17, 2015). "SXSW Film Review: The Invitation". The Austin Chronicle. Retrieved April 10, 2015. ^ Suzanne-Mayer, Dominick (March 15, 2015). "SXSW Film Review: The Invitation". Consequence of Sound. Retrieved April 10, 2015. ^ Zimmerman, Samuel (March 14, 2015). "SXSW Review: Karyn Kusama's The Invitation". Shock Till You Drop. Retrieved April 10, 2015. ^ Martin, Peter (March 15, 2015). "SXSW 2015 Review: THE INVITATION Asks Pensive Questions". Twitch Film. Retrieved April 10, 2015. ^ Tinnin, Drew (March 15, 2015). "Invitation, The (2015)". Dread Central. Retrieved April 10, 2015. ^ Donato, Matt (March 18, 2015). "The Invitation Review [SXSW 2015]". We Got This Covered. Retrieved April 10, 2015. ^ Wixson, Heather (March 14, 2015). "SXSW 2015 Review: The Invitation". Daily Dead. Retrieved April 10, 2015. This page was last edited on 30 March 2019, at 11:49 (UTC).